Tired of fighting the kamancheh? The kamanca is loosing tune? The German brand ‘Wirttner’ are making for years fine tuning accessories for western instruments – and are now making it for ethnic instruments. Wittner have developed their new line of fine tuning especially for instrument such as saz kamancheh, and tar. The idea lies in the structure of the peg, as only the peg head is turning while the peg itself stays static in the peg hole. The fine tuning peg is designed so you can tune your instrument in 100% accuracy and without slipping pegs effect. 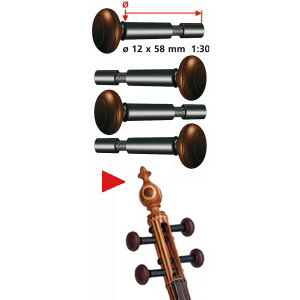 The price is for 4 pegs set, and fits Azeri and Persian kamancheh.